TOKYO – A pause in both the sell-off in global bonds and sharp rise in the dollar following Donald Trump’s election victory, together with Wall Street’s record high overnight helped Asian shares steady on Wednesday from a four-month low struck a day earlier. President-elect Trump’s plans to cut taxes and boost infrastructure spending would boost demand while his proposals to deport illegal immigrants and impose tariffs on cheap imports, if implemented, are seen likely to drive inflation higher. That prospect has given rise to expectations that US interest rates will rise faster than earlier anticipated, making the dollar stronger, but investors are still trying to assess what opportunities a Trump presidency will bring. MSCI’s broadest index of Asia-Pacific shares outside Japan .MIAPJ0000PUS rose 0.6 percent on Wednesday, bouncing back from a four-month low touched earlier this week. The dollar’s strength has fanned fears investors could shift funds to the United States from emerging markets. Emerging market stocks .MSCIEF managed to rise 0.3 percent on Tuesday after having fallen 7 percent over the previous four sessions. 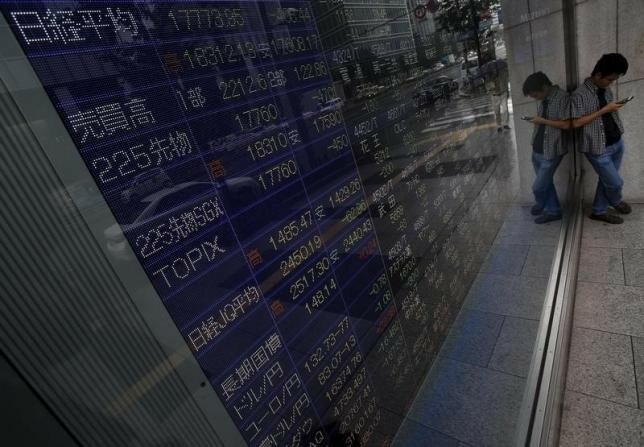 Japan’s Nikkei .N225 rose 1.1 percent to nine-month high on Wednesday, thanks to the dollar’s retreat from a 5 1/2-month high against the yen. The dollar was trading at 109.03 yen JPY= in late morning trade in Asia, having slipped slightly off high of 109.34 yen struck on Tuesday. On Wall Street, the Dow Jones industrial average .DJI rose 0.29 percent to a record high while the S&P 500 .SPX gained 0.75 percent. Since Trump’s unexpected victory last week, US shares have rallied while US bond prices tumbled, pushing up their yields sharply. The yield on 10-year US Treasuries US10YT=RR slipped to 2.207 percent from Monday’s 11-month high of 2.302 percent, although that is sharply above its levels around 1.86 percent before the election. US retail sales rose more than expected in October, pointing to sustained economic strength that could allow the Federal Reserve to raise interest rates next month. US interest rate futures <0#FF:> are pricing in an 85 percent chance of a rate hike, compared to 75 percent before the election. The two-year US notes yield fell to 0.989 percent US2YT=RR on Wednesday, having hit a 10-month high of 1.029 percent on Tuesday. Nikko SMBC Securities estimates US two-year notes are currently pricing in five Fed rate hikes in the next two years, said senior strategist Makoto Noji. “If we base our assumption on (Fed Chair Janet) Yellen’s gradualist approach, which can be roughly translated as two rate hikes per year, we could say that the market has already priced in tightening they could reasonably imagine at this point,” Noji said. “But of course if Trump’s policies stoke inflation that cannot be contained by two rate hikes per year, the US bond market could see big moves again,” he added. Sharp gains in US bond yields have drawn investors to the dollar, and its index against a basket of six major currencies .DXY =USD hit its highest level in almost a year on Tuesday. It slipped slightly in Asia on Wednesday to 99.982, but was still just 0.5 percent away from reaching its highest level in more than 13-1/2 years. The euro EUR= traded at $1.0724, just above Monday’s $1.0709, its lowest level in almost a year. The Chinese yuan CNY=CFXS also weakened to 6.8703 to the yuan, its weakest level since December 2008. Gold traded at $1,232.3 per ounce, not far from a 5 1/2-month low of $1,211.8 seen on Monday.